The BCF1 bench is a small horizontal torsion bench, built specifically to meet customer requirements. It is equipped with an asynchronous motor driven by a variable speed drive, it is suitable for testing small capacities need to develop a torque less than or equal to 250 Nm. The bench BFC1 can be used for laboratory or workshop production monitoring. It must be placed on a workbench or table, and complies with the current safety standard, and in particular it is equipped with a cover which, when it is open, stops the spindle from rotating. 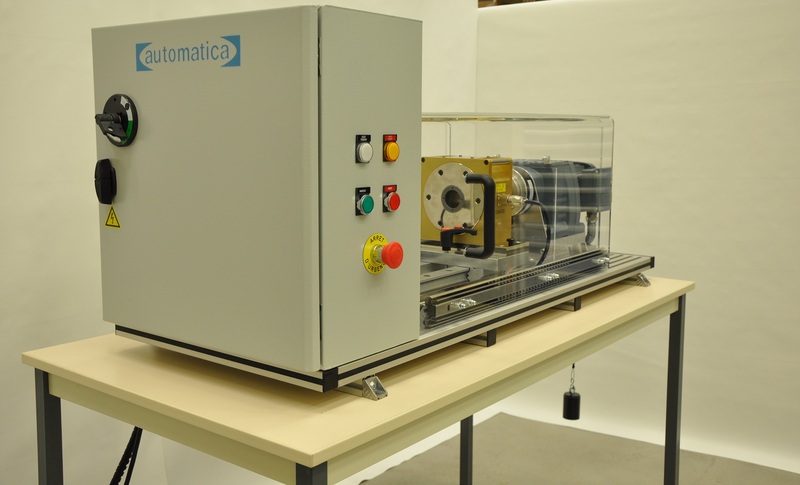 The BCF1 bench is compatible with the different Automatica IT solutions, it is ideally suited for operation with AUTOMATICA CALMAN ™, but it can be used with AUTOMATICA COMBAN ™ for the more complex testing.